We live in fast and modern times where flying is considered a normal and regular way to travel. Frequent travellers are used to flying several times a week / month, that its easy to forget that flying is truly one of the most amazing engineering feats man has achieved. So whenever a new aircraft is manufactured, I’m very curious to know what the world’s latest technology can carry out. The Dreamliner, Boeing 787 is Boeing’s latest commercial aircraft creation. Last June 2014, the 787 have operated over 100,000 commercial flights, and carried over 20 million passengers. 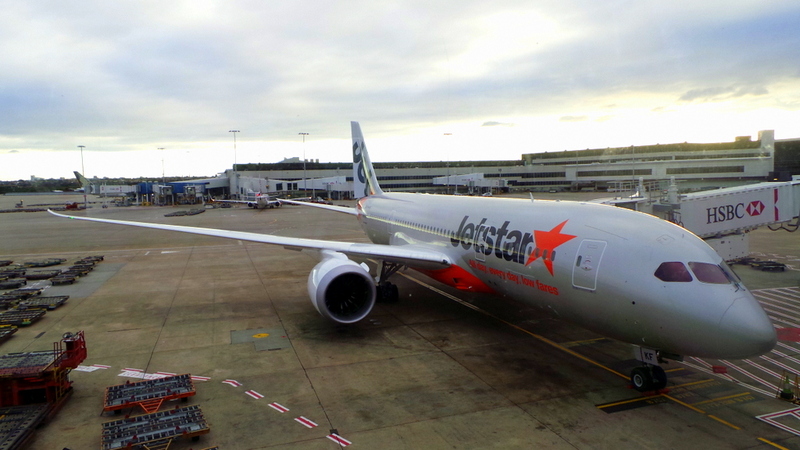 I recently had the opportunity to fly the Dreamliner with Jetstar Australia on their Sydney – Bali (Denpasar) return route. I flew economy on the way over, and business on return. In a nutshell, I can dare say that the Dreamliner is the first “smart plane” in the world of aviation. The first thing I noticed about the Dreamliner were the span of it’s wings. It also has a graceful angle, giving it an almost birdlike appearance. 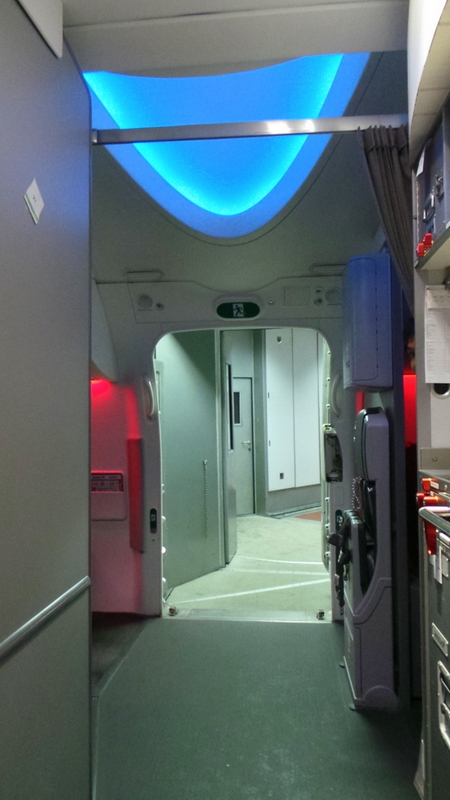 I do have to say, boarding the 787 has a mini- WOW effect. Apart from the fresh smell of a new aircraft, the ceiling is noticeably high so you don’t feel closed in, (or feel like entering a cave as other aircraft can make you feel) and the entrance also has a cathedral- like domed ceiling. I did feel the extra padding on the seats and the smart head rest (the sides of which fold), were really helpful. There are 314 seats on economy on a 3-3-3 configuration . The seats have a 30-inch pitch and 5 inches of recline. 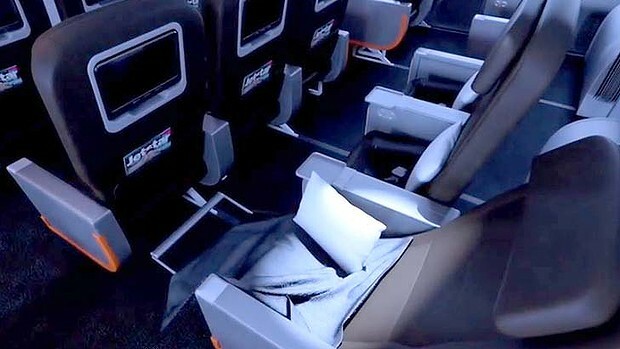 The business class cabin has 21 seats on a 2-3-2 configuration. I am seated at 3J (the last row) , having requested a window seat. 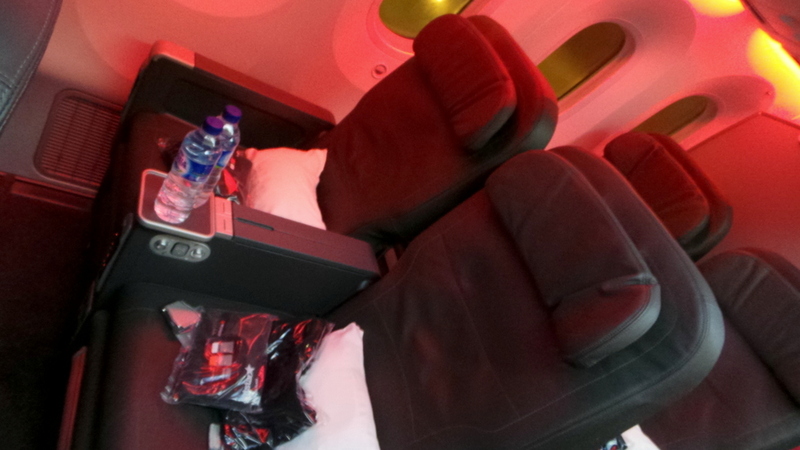 I later find from Seat Guru that 3J and 3K are the best seats in Dreamliner’s business class as they have 2 inches of extra recline, as it is used for crew rest on some flights. The recline was indeed very comfortable, and I fell asleep midway through a movie and woke up only when preparation for landing was announced. All seats on both business and economy have seatback in-flight entertainment screens. Each seat gets its own 10.6 inch touch screen. I love that it is a gate-to-gate viewing (meaning you don’t need to wait after take off to start viewing, or have to cut your movie short when landing). 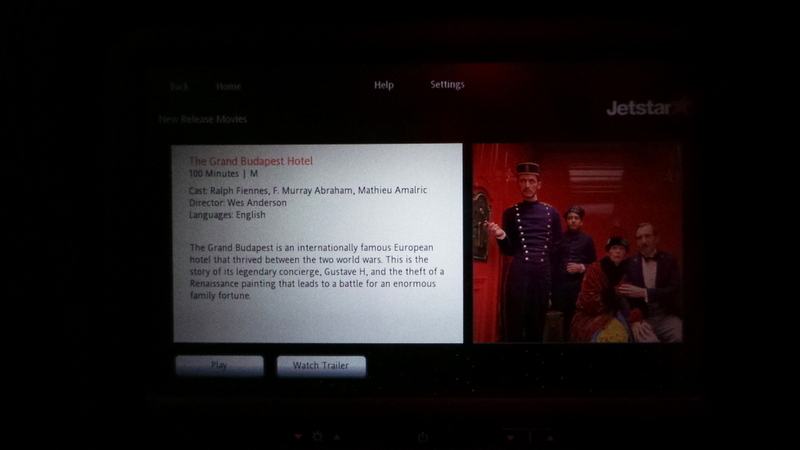 Entertainment system is free on all business class seats. I settle in to watch The Great Budapest Hotel after hearing a lot of recommendations. 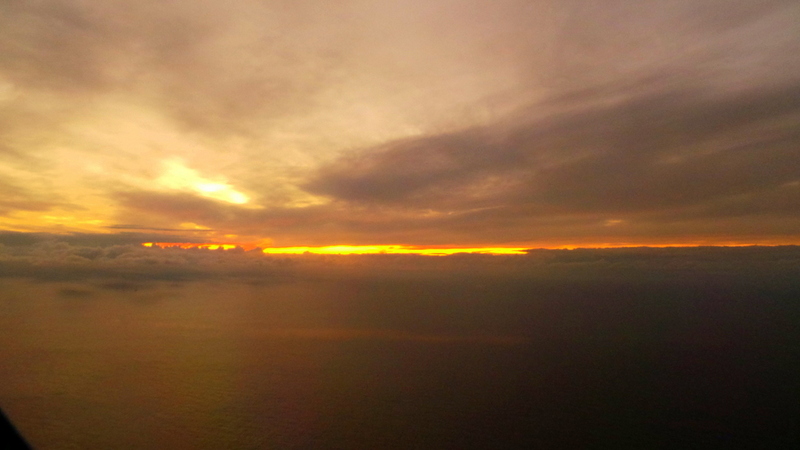 A quarter through the movie, the seat-belt sign flashed, and the captain announced turbulent skies ahead. I braced myself for the usual rock’n roll ride. And then the seatbelt sign came off. That was it! We’ve gone through turbulence and it was hardly felt. The 787 is equipped with a system that detects turbulence and commands wing control surfaces to counter it, therefore smoothing out the ride. On my flight back to Sydney (on business class), the passenger next to me did the biggest pet peeve ever: He took his shoes off, and he wasn’t wearing any socks. Double scoff! I looked at my amenity kit, saw earplugs and wondered if I could wedge them inside my nostrils. And before I could even register the hilarity (or necessity!) of this thought, the smell was gone. Like completely gone. I thought the man had senses to put his shoes back on. I took a quick glance to see him still barefoot and sleeping like a log. 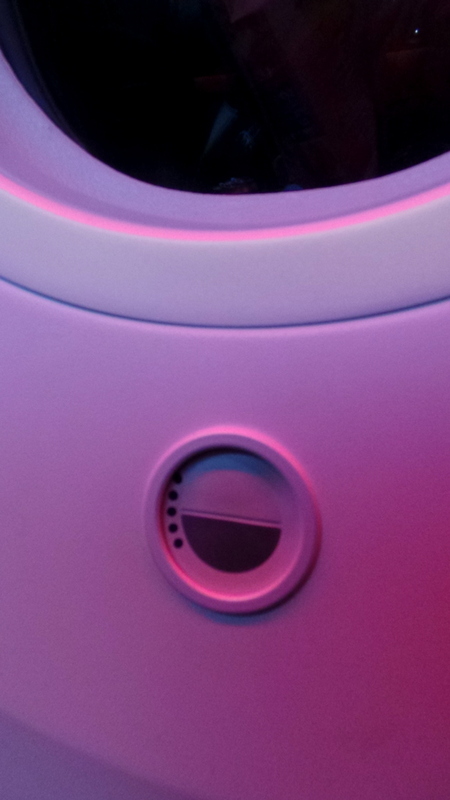 My sanity was saved by Dreamliner’s Filtrated Air System. THIS! 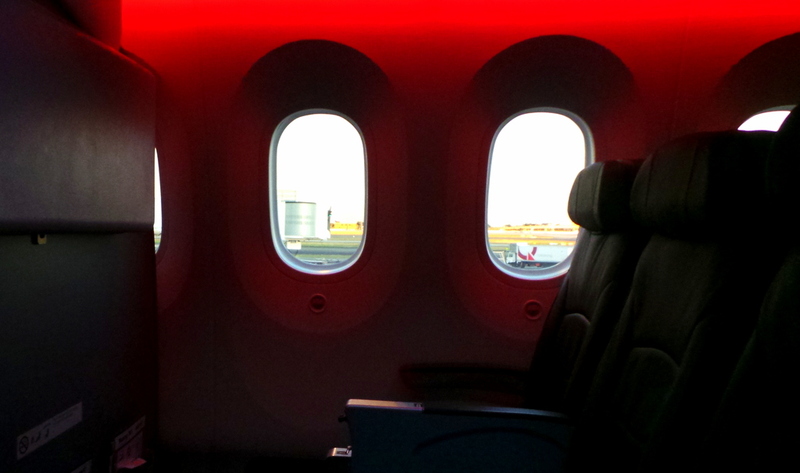 Is my ultimate favourite part of the Dreamliner. What a lifesaver. Not only does it come handy when the passenger next to you commits a faux-pas, but this system also saved my skin from being dry. After mid to long haul flights, my skin is usually a map of dry flakiness especially around the nose area (and this is why I always take with me a small tube of moisturiser). However there was no need to do this on this flight. I didn’t even re-touch my makeup and still looked decent on landing– a rare feat especially on a red-eye flight! This is a really marvelous concept introduced to an already smart plane. 2 years ago, I wrote a blog post on how to travel when you are sick and suggested that if you can, try postponing your flight because if you have colds or cough, it will only get worse due to the stale air inside the aircraft (not to mention you may contaminate hundreds others!). I can now say that you won’t have any dry or extra irritated throat or nose when on the Dreamliner. I normally get the sniffles on flights that will be gone the moment I get out of the plane. None whatsoever on this flight. This is the feature that I was most excited about. I love viewing landing sights (and have a photo collection of them too!) 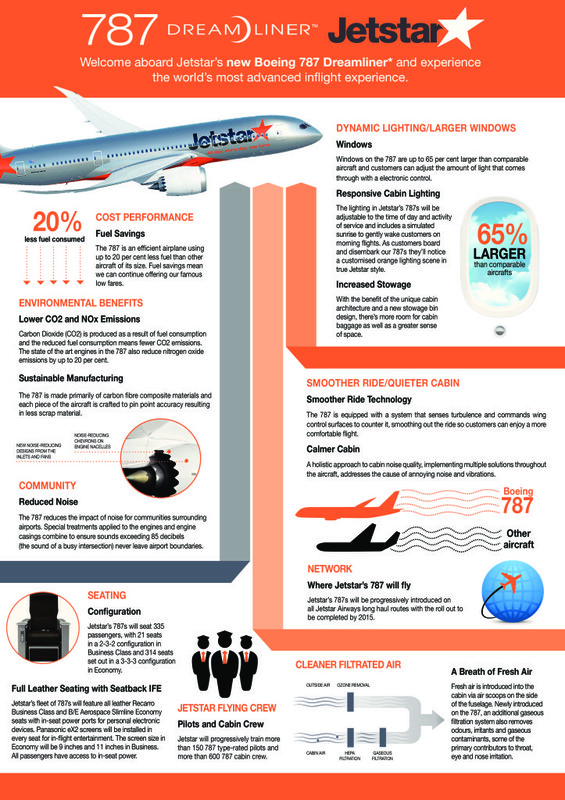 so having extra large windows ( 65% larger than comparable aircraft) was a plus for me. But being large is not just the windows’ amazing feature. Say goodbye to those moments during preparation for landing, when you’re still enjoying your snooze and the cabin crew wakes you up to pull the window shades up (or at least the sharp snapping sounds of the process of window shade shutting/opening wakes you up). Because these windows will automatically go to clear mode on take off and landing. Yes, the windows have 5 shades of dimming to your likeness. It goes from clear to almost opaque. the first light of Sydney’s sun announcing that it is Monday! I also noticed that the aircraft ran quite smoothly. 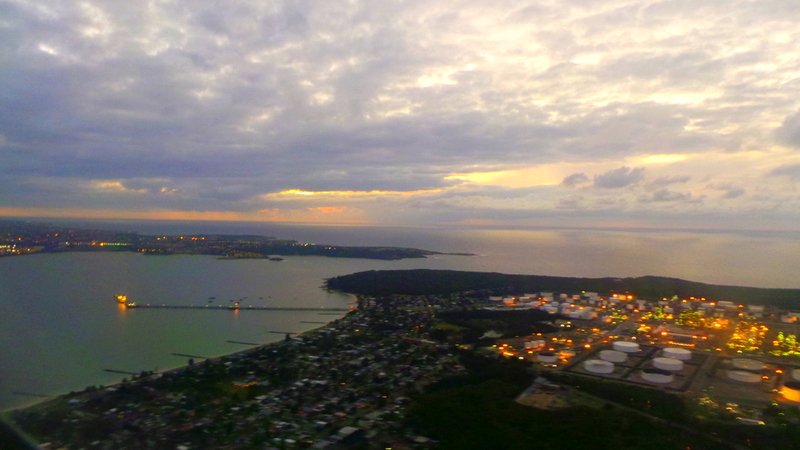 Even during take off , when the engines go on full throttle, the most you can hear and feel are rumblings and vibrations. This is not just convenient for passengers, but for people who live in the surrounding areas near airports as well. The 787 uses up to 20 Percent less fuel than other aircraft of its size. The fuel savings doesn’t only mean that airlines can have the capacity for lower running costs (therefore possibly lower fares), but it also means the 787 is environmentally friendly as less carbon dioxide is produced. I never used to be particular about aircraft and thought that those who choose their flights based on the aircraft type were ‘petty’. With 20 airlines (and counting!) now flying the Dreamliner, the 787 has flown more than 100,000 revenue flights and I know that I will proactively choose a flight on this aircraft if there was an option. 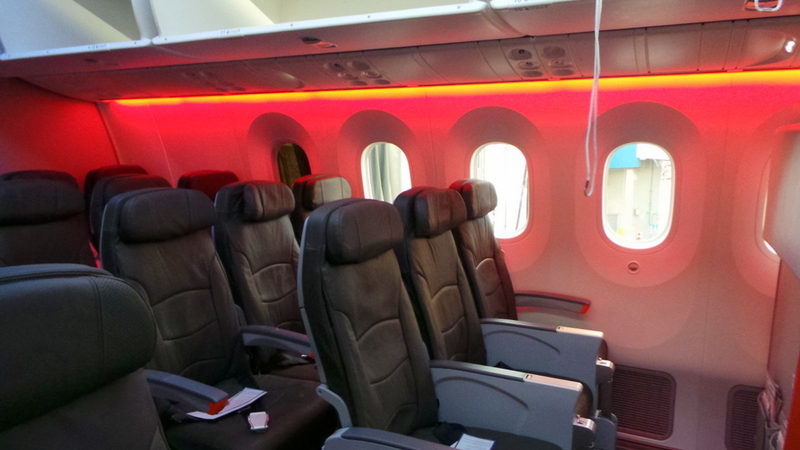 The Dreamliner is an aircraft that looks after both the health of passengers and the health of the environment outside. All that while being easy on the eyes. I flew on the Dreamliner to Bali from Sydney as a guest of Jetstar Australia and Boeing, however all opinions and thoughts are my own. Hi Anna! It really is one of a kind I sure have never gone inside an aircraft like that before. In size, yes there are others bigger and grander. But haven’t been on one that’s as smooth and as responsive. Yup, the mood lighting! 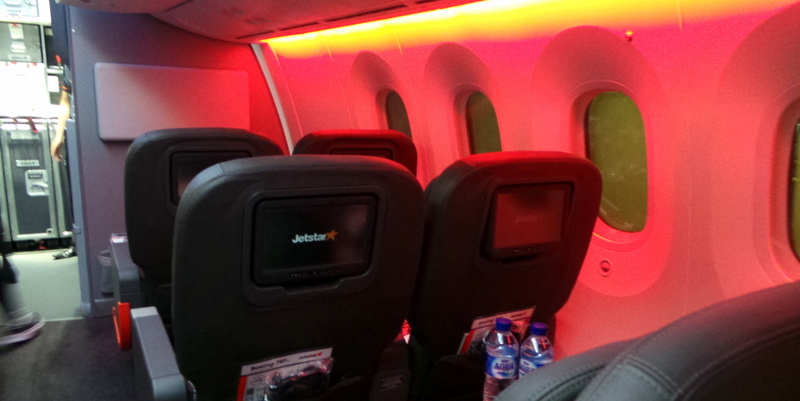 I think it also varies on every airline as I’d seen a review on a Qatar Airways one and the lighting was purple. 🙂 And thanks I did have a wonderful break now back to winter! Dang, that looks like a nice aircraft! Love the lighting, it really sets the mood haha. It sounds like a great plane and I love the filtered air feature and the windows! It’s really so smelly on planes and I get that feet smell but really it’s inconsiderate to remove your shoes if you have smelly feet. Hi Lorraine, yes the filtered air is the best feature for me as I feel the effect the most. Less chances of feeling like minced meat after getting off a mid-haul economy flight. 🙂 Re: feet – its so gross when people do not wear socks at all with closed shoes! (not the sandal/flats type), and promptly remove it. On my flight on the way over, the lady next to me wearing flats did take her shoes off but at least she immediately put socks on. I really need to fly on the new Dreamliner; a few years ago my other half and I had a VIP tour of the Boeing factory in Seattle and it was such an amazing experience and I have always said since that I need to fly on the Dreamliner after seen it getting made. Boeing were really proud of the filtered air system and that will help so much of longer haul flights! Boeing have definitely got a winner on their hands with the Dreamliner! Wow! Very interesting and insightful article. I would really like to try this. It looks comfy. Thanks Richen! 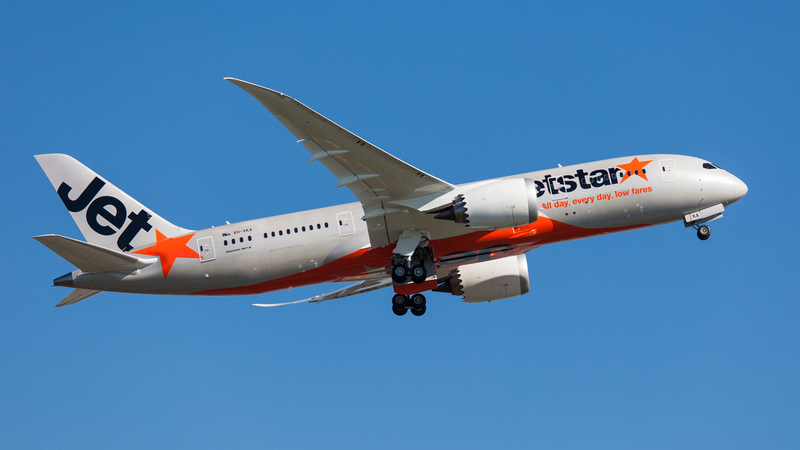 I remember you took Jetstar for your Bali trip earlier this year. 🙂 Was it the dreamliner also? Interesting, great that it uses less fuel, isn’t that fab? And the dimming windows sound a really cool idea. Recently I’ve been on flights with the folding headrests and it’s a joy not to have to travel with a small pillow any more. 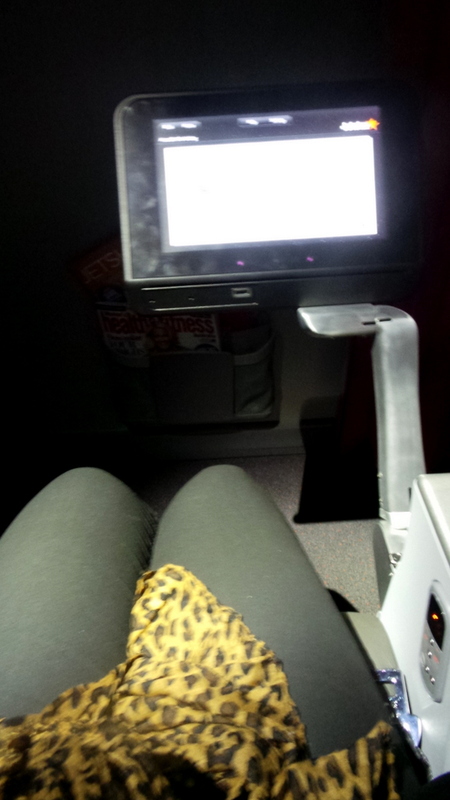 I’ve flown overnight home from Bali twice in economy and will never do it again!!! It’s got to be business or fly via Singapore!! Would say Business class is worth it if it was more than 2 times the price of economy? Hi Sammy, I would say it’s worth flying business on the return flight (red- eye). Outbound is ok because you’re heading to Bali anyway 🙂 And go for the bulkhead seat on Economy!